The growing need to improve people’s health and wellbeing is leading to a significant investment in leisure centres across the UK. Local authorities are responding to the demands of local communities with enhanced services and facilities. From Olympic-size swimming pools with movable floors through to extreme sports areas and state-of-the-art-gyms, leisure facilities are becoming significantly more advanced both in terms of technology and design. M&E contractors involved in the construction of new leisure centres have to adapt and hone their skills. Designing and installing the diverse building services required for these facilities is challenging and requires specialist knowledge. More technically-challenging projects will often require M&E consultants to be involved in the very early stages of the project, working as part of the team and often, prior to signing a contract. Given the risk, challenges and complexity of leisure developments, this is a growing requirement, which means that many main contractors are now seeking M&E partners that have the knowledge, resources and internal design and build capabilities. Early engagement is essential to develop an M&E solution that’s tailored to the brief. In doing so, any potential issues can be identified at the beginning, saving time and improving efficiency during the installation stage. 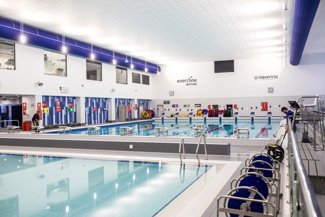 One of the most challenging aspects of a leisure facility is the swimming area, where it is crucial to ensure that health and safety regulations are met. All M&E equipment installed in this area must be suitable for the corrosive, chlorinated environment. This usually involves sourcing specialist materials such as bolts for the electrical containment area and treated paint for the ductwork. As chlorine degrades lights and can discolour casings, ageing lights well before their time, light fittings must also be both chlorine- and moisture-resistant. As leisure centre design becomes more sophisticated and services increase, so does the number of equipment suppliers. As a result, a key part of our role is co-ordinating with these companies to ensure everything is installed correctly and in line with very specific requirements. If the swimming pool is to be used for competitions, M&E contractors must also liaise closely with organisations such as Swiss Timing and Sports England to meet their stringent requirements. In many cases, that involves sourcing and installing lighting at a particular brightness and specific types of containment and wiring for starting blocks. Offering such a large number of facilities means that leisure centres must find ways to improve energy efficiency. This can be achieved by implementing a building services solution combining several key elements that are easy to use and work together to minimise energy consumption as well as costs. 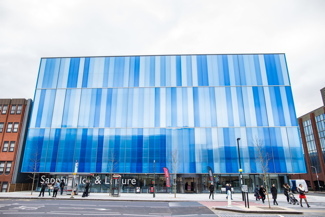 Romford’s £28m Sapphire Ice and Leisure Centre opened earlier this year and is one of the most complex in terms of its design. 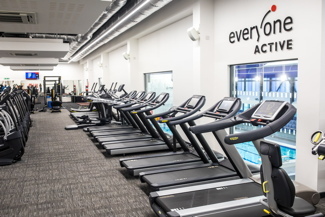 Funded by the London Borough of Havering and Sports England, the facility is located in the heart of Romford town centre. It is one of only a few in the UK to feature a floating ice rink above a competition swimming pool, adding to the M&E challenges. As the build space was so limited, Saunders Boston Architects designed the 56m x 26m rink above the eight-lane swimming pool rather than side by side at ground floor level. A robust structure was required to accommodate the ice rink, which given its position above the swimming pool, was created without using internal columns. As the project was so complex, all of the contractors and specialist teams had to work closely together from the outset to understand and address any potential challenges. This included collaborating with the structural engineers to ensure that all of the M&E services could be carefully coordinated. Appointed by Kershaw Mechanical Services, REL was involved in the electrical design from the early stages, responsible for developing and evolving the concepts as the project progressed to ensure maximum efficiency and performance. Initially the focus was on value engineering, ensuring the electrical elements could perform effectively within the required budget. However, the project spent a number of years in the pre-construction stage so as the timescales shifted, there were opportunities to review the electrical design. Within this time, there had been a considerable revolution in LED lighting technology, so we reviewed and altered the lighting design to significantly improve performance, energy efficiency and running costs. In the swimming pool hall there were additional challenges as the lighting had to meet the strict criteria set by Sports England and maximise safety. The design had to achieve a high level of lighting for competitions but eliminate glare on the pool surface as this can inhibit surveillance. LED uplighters ensured compliance with Sports England and reduce maintenance. To reduce glare on the water, the uplighters were arranged in such a way that all light was directed evenly over the ceiling, which in effect, meant the ceiling became the luminaire. The swimming pool and the ice rink were built in a double height space, so in each area, the lighting had to be installed at a height of seven metres. In the ice-rink, high-bay LED luminaires were used. These were coordinated with AV equipment gantries which result in uniform light over the rink and minimise glare. The lighting design extended to the outside of the building, which has a striking façade designed to resemble a block of ice. Lighting emphasises the architectural cladding, giving the facility its unique appearance. This was achieved by creating a vertical ribbon of light at specific points, comprising a very thin watertight LED strip just 16mm wide. Cool-white LED lights set off the blue panelling for maximum impact. As the facility is in the town centre, there was limited storage space and no car parking. This required very accurate programming to ensure that electrical items were delivered at exactly the right time to enable us to install them straight away. The design of the fitness suite also presented installation hurdles. With 100 stations, the electrical equipment is vast but there was only a 65mm void in the floor through which to feed all the services. This involved very careful co-ordination of the power and IT wiring, which had to be segregated within the small space but then connect to the same machine. Leisure facilities are transforming, bringing innovative new designs and facilities to local communities. This is creating construction challenges, but M&E contractors which can engage early with project teams and provide specialist knowledge and skills, can ensure these are smoothly overcome.